Chicken tikka masala is an extremely popular curry dish that you will likely find on most Indian restaurant menus. The origin of the dish is uncertain, but many believe it was first served in the U.K. Classic chicken tikka masala typically includes a yogurt marinade, cream and coconut cream, spices, and tomato sauce or purée. With the Instant Pot pressure cooker, you can have this delicious dish on the table in under an hour! This Instant Pot version starts with a simple spiced yogurt marinade. Tomatoes and a wide variety of spices flavor the rich sauce, and the heat can easily be tailored to suit your tastes. 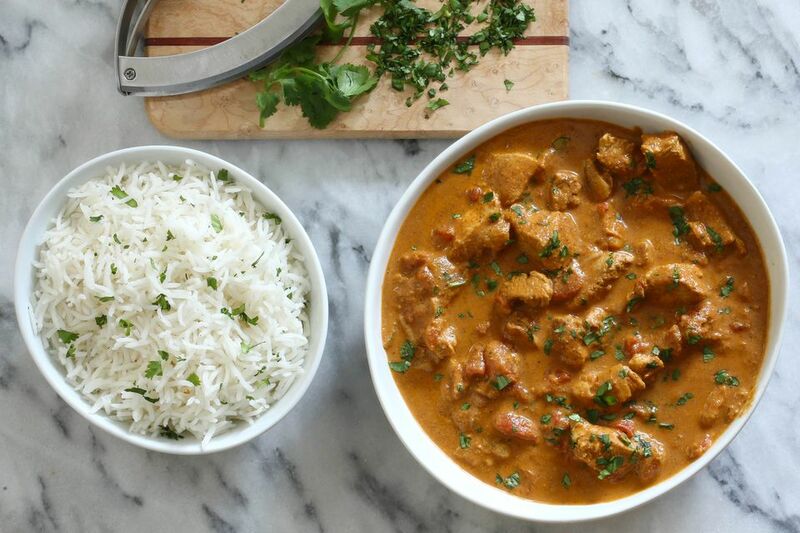 Serve chicken tikka masala over a mound of basmati rice along with naan bread and a garnish of chopped cilantro. In a large bowl, combine the chicken with the yogurt, 1 tablespoon of the garam masala, lemon juice, ginger, and black pepper. Refrigerate the chicken with the yogurt marinade for 30 minutes to 1 hour. Choose the lowest sauté function on the Instant Pot. When the pot is hot, add the ghee or unsalted butter and swirl it around until it is melted. Add the onion and sauté for 2 minutes. Add the garlic and cook for 2 more minutes, stirring constantly. Add the chicken stock and cook for 1 minute longer, scraping up any browned bits on the bottom of the pot. Add the tomatoes with their juice, tomato sauce, the remaining 1 tablespoon of garam masala, smoked paprika, coriander, turmeric, kosher salt, and a dash of cayenne pepper (or more if you like heat). Add the chicken to the pot and lock the lid in place. Turn the steam release valve to the sealing position and choose the pressure cook setting, high pressure. Set the time for 10 minutes. When the time is up, carefully turn the steam release valve to the venting position for a quick release. Stir the heavy cream or coconut cream into the sauce and transfer to a serving bowl. Serve the Instant Pot tikka masala with purchased or homemade naan bread, basmati rice, and fresh chopped cilantro. The recipe calls for coconut cream (the unsweetened kind found in the Asian food section). If you can't find coconut cream in your local market use the thick cream you will find at the top of a can of coconut.